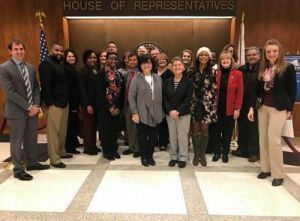 Members of the Pensacola State College President’s Leadership Institute (PLI) visited the state Capitol in Tallahassee on Jan. 24 and 25 and saw the Florida Legislature in action. 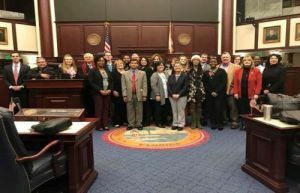 During the trip, the PLI membership was recognized by District 1 Rep. Clay Ingram in the chambers of Florida House of Representatives. The group also met some members of the Northwest Florida Legislative Delegation ─ Ingram, District 1 Sen. Doug Broxson, District 2 Rep. Frank White, District 3 Rep. Jayer Williamson and District 4 Rep. Mel Ponder. PLI members also met with Florida Colleges and Legislative Advocacy CEO and Executive Director Michael Brawer, and had dinner with Florida College System Chancellor Madeline Pumariega and Florida College System Foundation President Judy Green.